We spent the afternoon at the county fair. We visited the petting zoo, toured the Orange Country Building, checked out the photography and art display, and rode on a few rides. Falyn was so good! She was in the stroller the entire time we were there and never cried once. She slept for part of the time and then just hung out and looked at everything. Everyone was so tired by the time we left. Partly due to the heat. It was around 98 degrees when we got there. It had cooled off to around 91 by the time we left. (Did I mention that the stroller has a digital thermometer and clock?) 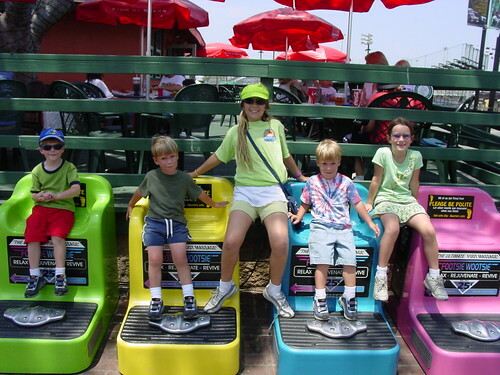 We usually go to a lot of the other stuff at the fair, but everyone was just too hot and tired this year. The rest of the pictures are on flickr. We had a meeting today with Brain (the planner) and Ken (the contractor). Brian finished up the preliminary plans and presented them to us and the contractor. We will end up with 2 new bedrooms, a office, a bathroom and a study alcove. The next step is for Ken to come up with a ballpark estimate of the building costs. We will have to meet with him to discuss which parts of the project we are going to do ourselves and then it will take him one to two weeks to get back to us with the estimate. After that, Brian will do the final plans and get the structural analysis done. He said that will take 4-6 weeks to complete. That means we are look at October before any work at all will start. We rarely get thunderstorms here. So when we do get them, it turns into something of an event. This morning we had a thunderstorm come through. Complete with thunder, lightening and rain! Dan took the boys out in the car and went looking for the rain. They found some south-west of us then headed back home. By the time they got back, it had found us. We had rain and lots of lightening flashes. We all went outside to watch the storm go by. It didn’t last very long, but we enjoyed it while it was here! We found out later that the storm had knocked out power to Dan’s parent’s house. They still didn’t have power tonight. I hope they get it back by the morning! Falyn was baptized today. 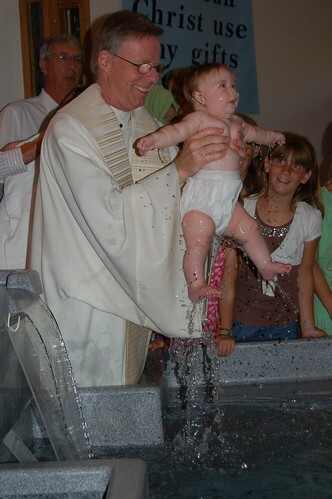 There were a lot of babies Baptized at the ceremony, around a dozen or so, but I didn’t count. Father Bruce did the ceremony. About half the Baptisms were preformed in Spanish. Our church has a very large Spanish and Vietnamese population. It is always interesting to participate in a multi-language ceremony. Unfortunately, it seems that most of the people there had never set foot in a church before. Their behavior was appalling! The people in front of us were talking the entire time and standing up in the aisle taking picture during the ceremony! They were not even paying any attention to the priest. At one point he asked that everyone put away the cameras and join him in a prayer for the children. I don’t think they even heard him say that! They kept right on taking pictures and talking. I felt it was horribly disrespectful and know of several other priests that would not have put up with that behavior and let them know just how disrespectful they were being. Falyn was sound asleep when I handed her to the priest for her Baptism. She seem quite surprised by the entire thing, but didn’t cry at all. They gave you the choice of doing full immersion or not, and we chose to have full immersion. Chantel took the pictures for us and captured her Baptism really well. We had a BBQ at our house after the ceremony. Then we all went swimming over at the Pauly’s house. It was Falyn’s first time in a pool! 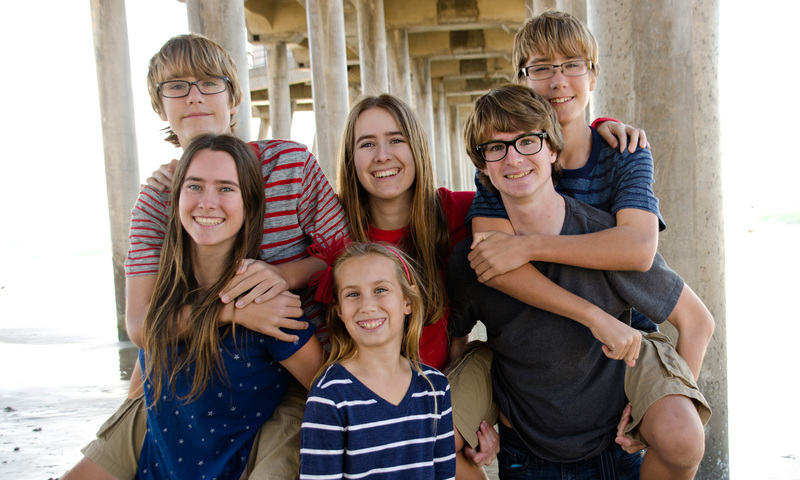 I don’t have any pictures, because there was no way to juggle a camera, the baby and keep an eye on all the kids in the pool all at the same time. She did really enjoy it though! The boys had so much fun playing in the sprinkler this morning. I had Dan buy them this oscillating sprinkler specifically for the kids to play in. 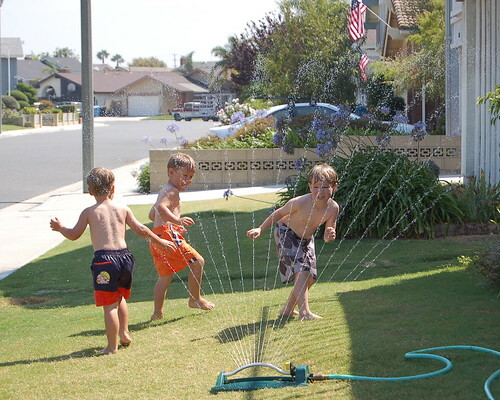 I remember how much fun I had playing in this type of sprinkler when I was a kid. I wanted my kids to be able to experience this too. It has been so hot here lately. This is the perfect way for them to cool off. 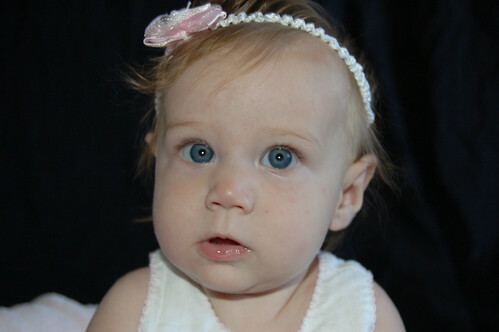 Falyn turned five months old today. She is getting so big! She can sit all by herself now and is rolling all over the place. Enjoys sitting and playing with her toys. She also loves to bounce in her jumperoo and play in her exersaucer. She is such good baby. She is rarely fussy and loves to be around people. She does not like to be left alone and will cry if she is by herself in a room. The new swim session started this week. Jared and Riley are in one class and Aidan is in a different one. The are all doing well. 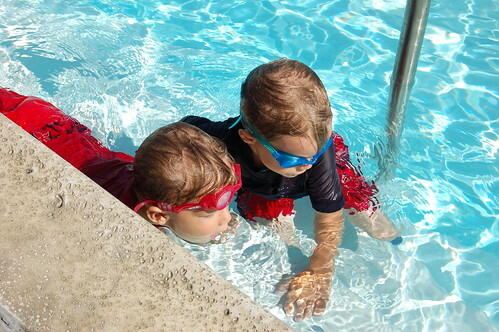 The twins can both float on their backs by themselves and Aidan is learning how to do big arms with breathing and can also do backstroke. The twins are suppose to sit on the top step when they are waiting their turn. They keep getting in trouble for not staying there. Grandma Nancy came along today so that I could take pictures. More pictures here. We spent the morning at the park. The kids wanted to have snack there, so we brough along their snacks. 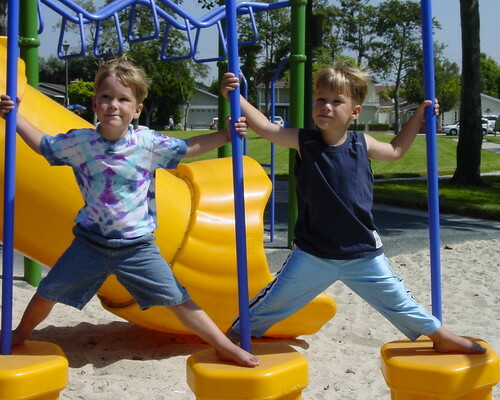 They had fun playing in sand and on the play equipment. While we were there we saw a squirrel. The kids enjoyed watching it run all over the park. I brought my camera along and took a bunch of pictures, which are in my flickr account. 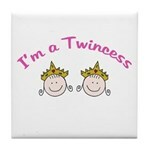 This is a cute new design for twin girls who love to pretend they are a princess. You can see all the available products here. 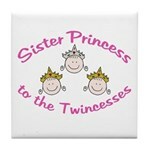 Also available, a design for sisters of twin girls. You’ll find the Sister Princess items here. Taken this morning – Falyn’s feet with our wedding bands. I keep toying with the idea of becoming a professional photographer. Dan’s response is “When do you have the time to do that.” I know he is right, but I love taking photographs and I think I’m pretty good at it. I do have a lot to learn before I could open a studio. And would need to buy additional equipment. The more I research it, the more I am convinced I could make money doing it. Perhaps when Falyn is older I’ll be able to really pursue it.